Today my little project of spying on the neighbourhood builders became an exercise in mutual voyeurism. Now four storeys high, the new apartment building suddenly seems quite close, and the builders notice as soon as I step onto my balcony. There is lots of grinning, and they call out to me a bit, but I can't understand what they are saying so we just all acknowledge one another with smiles. 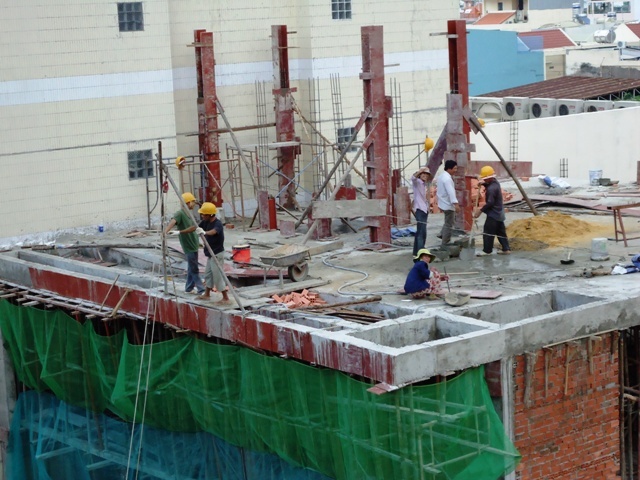 The person squatting there in the dark blue top with the bright yellow frilly hat is a woman - the first I've seen on a Vietnamese building site. She was also wearing one of those facemasks that the motorbike riders wear, but she kept pulling it down so she could grin at me. Her job today was pulling nails out of timber so the timber can be reused. When I first looked at the construction site, I thought that those long rust coloured piles (or frames, or whatever they are) you can see sticking up for the beginning of the next floor, and also on the front edge of the floor, were iron. But actually they are just light wood - probably plywood. The builders nail them in place as they begin each floor, thread long metal rods through them and then pour the concrete (by hand of course) into them. Once the concrete is dry, they pull them off and use them again for the next level. The concrete on the floor they were were working on today was poured yesterday. Here's a video of the process. Today it is dry already, and you can see that they have already started to put up the next floor. I don't know how tall this building is going to be, but they look as though they've got a bit of work to do yet!